The Container Loading Conveyor is designed to aid metal processors in loading scrap into shipping containers. The conveyor is portable and powered by a diesel engine so that it can be positioned near the scrap pile. The container is backed up to the cantilevered conveyor. 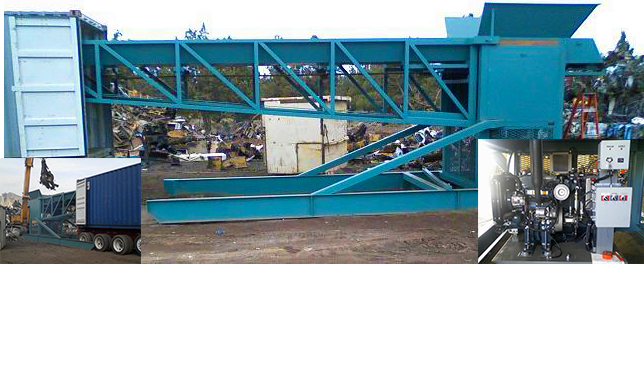 A grapple and/or magnet operator can load scrap onto the tail end of the conveyor. The head end of the conveyor protrudes approximately 36 feet into the container. A wall attached to the conveyor contains the scrap and forces it to pile up. As the container fills, it needs to be pulled forward to allow the filling process to continue.